For the past two days I've been hanging out with a bunch of game researchers, designers, and girl gamers as part of the Girls and Games event organized by Yasmin Kafai at UCLA. There was much that is worthy of writing and comment about the gathering but one unexpected side-effect of the event was that I got to participate in my first Nintendo DS backchannel! I know this is not exactly news to those who participate more regularly in gaming conferences but it was a first for me. During the workshop the DS and Sidekick owners were eyeing each other's gadgets, so I decided it was worth having both at the public event last night to see if I might be able to pictochat during the event. When I remembered to pull my DS out of my bag half way through the first panel, I saw that there were already two people in the pictochat chat room. What a thrill! I had no idea who these folks were but was quickly greeted by "Hi" scribbled with a stylus on the DS touch screen and sent to the shared wireless pictochat room. Scanning the room, I quickly figured out that one person online was Morgan "Rhoulette" Romine of Frag Doll fame. She had conveniently used her gamer handle. We quickly started pictochatting about where we got our pink DSs. I still am not sure who the other DS owner was on that first little chat. 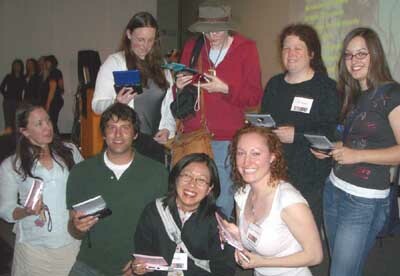 When I got up for my panel I invited other DSers to join our pictochat and we gathered a group of eight out of an audience of about 120. Okay, so that wasn't very good saturation but it was still fun as a new kind of backchannel experience that relied specifically on a localized network. With the local networking function, the DS functions much like Tamgotchi networks, becoming visible tokens of participation in a wireless portable gaming culture. The feel of the DS backchannel was different from my usual backchannel experiences with AIM or irc. The very local and ad hoc network had a stronger tie to that particular localized event. Although conference backchannels on AIM or irc are dominated by participants in the same room, there is also the sense that the network transcends that space. I find my conference IM window competing with multiple private IM windows of people both at the event and outside of it. With the DS, just powering up the device and instantly seeing who was "there" had properties of lightweight participation in place that felt quite different from logging into a chat program on a powerbook already crowded with different communication tools. My gadget fetishism did get the better of me as I was IMing off my sidekick about the event to friends offsite while pictochatting with my new buddies on the DS network. Managing flipping the multiple little screens, stylus, and tiny keyboard at the same time did have me missing laptop windowing and the lightning speed of qwerty typing. Still, I've found a new side to my seashell pink DS, and I know that I'll look back on this day of DS backchanneling as a fond first. I was looking for other blogs that posted on the Girls 'N' Games event and came across yours. This is really interesting, since I didn't know about backchannels through IM or IRC!